All robots tremble at the sight of Predaking, leader of the Predacons and the first-ever Cybertronian to change into a full size dragon! 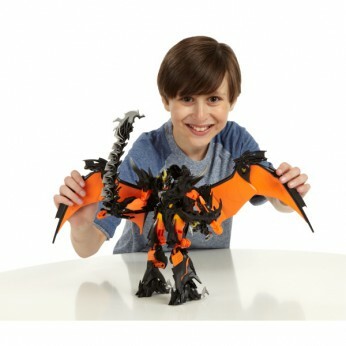 Predaking features light-up snapping head action and features powerful robot or terrifying dragon mode…. All robots tremble at the sight of Predaking, leader of the Predacons and the first ever Cybertronian to change into a full-size dragon. It features a light-up, snapping head action and will square off against Beast Hunter Optimus Prime in either powerful robot or terrifying dragon mode. All robots tremble at the sight of Predaking, leader of the Predacons and the first-ever Cybertronian to change into a full-size dragon. Features a light-up, snapping head action and will square off against Beast Hunter Optimus Prime in either powerful robot or terrifying dragon mode. Batteries required: 2 x AA (not included). For ages 5 years and over; EAN: 5010994722616. WARNING(S): Not suitable for children under 3 years old. This toy costs approximately £47.99 (for the latest and best prices make sure you check our retailer list for the Transformers Beast Hunters Predaking above). In our review of Transformers Beast Hunters Predaking we classed it as being suitable for ages 6 years, 7 years, 8 years but recommend you check the manufacturer specific advice before purchasing.